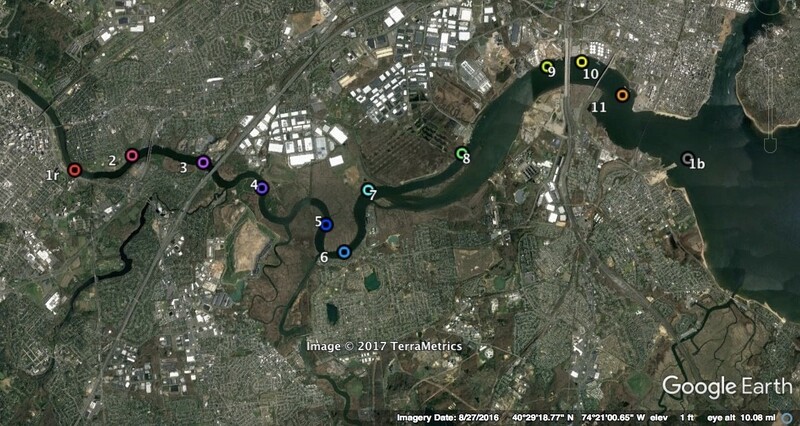 This summer, Rutgers undergraduate student Laura Wiltsee, advised by Dr. Josh Kohut, worked with the New Jersey Department of Environmental Protection to produce a profile of the water column at different sites along the Raritan River, as marked on the map (click to view full map). 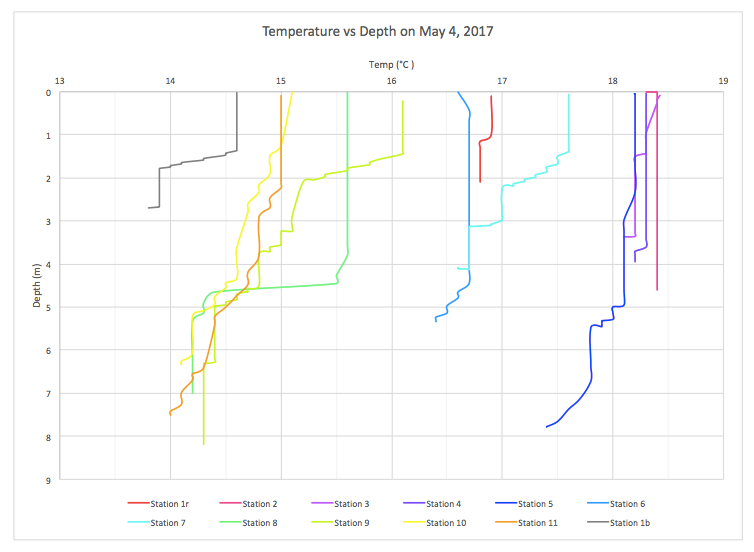 The profiles of the temperature and salinity shown on this page are for twelve locations along the Raritan on May 4, 2017. The data was collected using a YSI ProDSS sensor. The river is generally warmer upriver staying just above 18 °C for stations 2, 3, 4, and 5 (Figure 1). The stations then become increasingly colder with movement downstream, with an outlier of station 1. 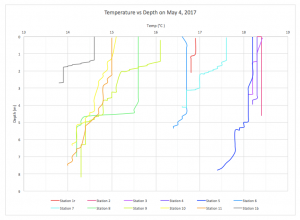 The cast also showed that most locations experience a drop in temperature, which tends to coincide with an increased salinity caused by a salt wedge. This is most defined at the downstream locations, specifically station 8 between 4 and 5 meters. 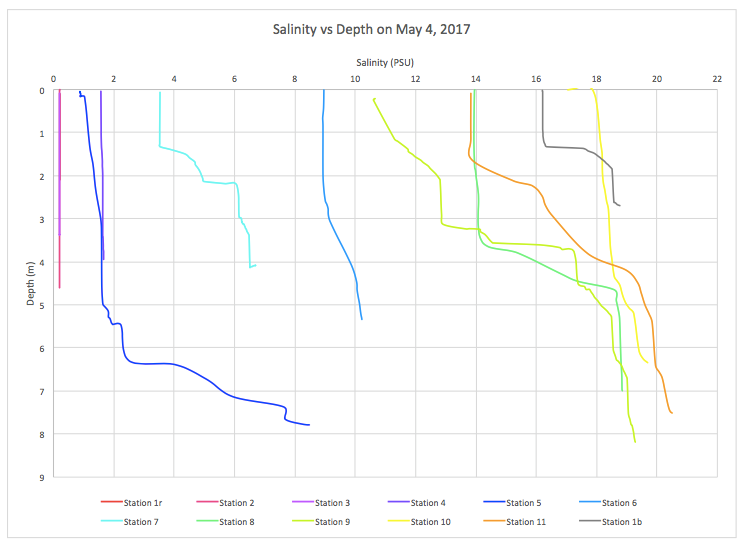 Figure 2: Profiles of Salinity vs Depth from data collected on the 4th of May, 2017 using a YSI ProDSS sensor. Site 1r is the closest to Rutgers’ Cook campus, next to the Class of 1914 Boathouse and station 12 is out in Raritan Bay. 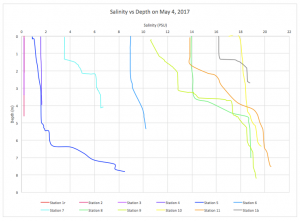 Station 1, 2, and 3 have the same salinity at 2 PSU throughout the water column, indicating a greater influence from the River (Figure 2). Station 5 shows the beginnings of the salt wedge, which is caused by the cool and dense salt water from the bay moving in below the fresh and warm river water. All the downstream stations show this salt wedge, however the salt wedge becomes shallower closer to the bay. This means there is less fresh water to settle above the salt water.